Rate this Article Unlike many other clickbait articles, the results from this revolutionary study done by Google and Newzoo will actually shock you, regardless of whether you are a gamer, a developer or a publisher! There’s a certain stereotype when it comes to gaming; that it’s a male hobby, and mostly alien to women. That some women still think of games as something their children play locked in their rooms, or their partners entertain themselves within their spare time. Contrary to the still widely believed image, mobile gaming is largely preferred by female audiences. Smartphones are now an inseparable part of modern life, and games produced for Android and iOS devices have a very large female demographic. As the study “Change the Game” by Google and Newzoo from 2017 indicated, 65 percent of US women play mobile games. In fact, women make up 49 percent of total players on mobile. 64 percent of female respondents preferred smartphones as a gaming platform over PC and consoles. Other studies brought up perhaps more unexpected information. Chartboost network’s study of a sample of over 64 million devices registered in the network suggested the mobile gaming audience is made up mostly of women aged over 25, with the biggest age audience segment for both genders specified as 35 to 44. This is a revelation that casts the commonly held image of mobile gaming aside. The average female mobile gamer today, as described by Gameanalitics, is a thirty-seven-year-old who’s financially independent, be it a young mother or professional with a corporate background. The question then has to be asked: why women are so attracted to mobile games? According to a “Change the Game” study, women name three main reasons they like to immerse themselves in gaming: they seek entertainment, they use games as the stress relief method, and the moments of gaming are viewed by them as restful. In opposition to the view of mobile games as something you do during commuting or waiting for something, the preferred gaming locations of women are at home, with more specific places like in bed or in the bathroom ranking the highest among respondents. Games are clearly a great method of enhancing the mood for female respondents, as 60 percent of them have stated that they make them feel “good”. And what kind of games resonate the best with women? The one thing that’s worth to note is the fact that game producers are still creating for a predominantly male audience with male-oriented products. “Change the Game” is a study that’s part of a larger initiative to change this. It isn’t that women don’t play games traditionally viewed as male-oriented, like for example multiplayer online battle arena genre (MOBA). 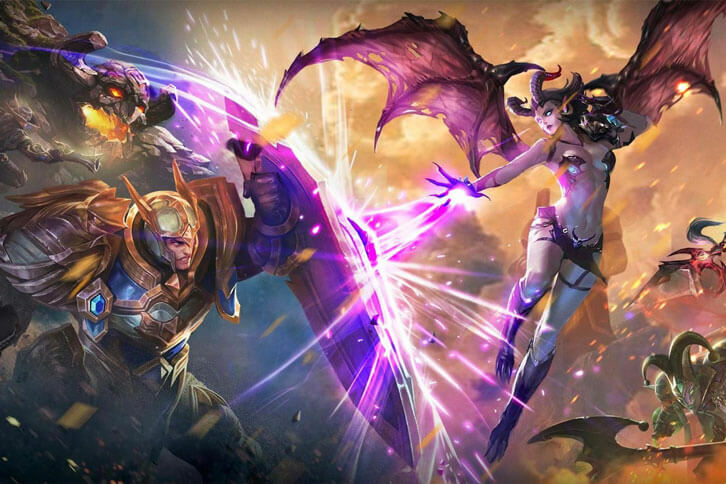 Arguably the top gaming company in the global market, Tencent, reported last year that 52 percent of the players of their game Honour of Kings, most popular MOBA on the mobile devices thanks to its huge success in China, are female. In comparison to the most popular PC title in the genre, League of Legends, and its 35 percent female audience share, it was certainly a big surprise to see women in China become so much invested in the regions bestselling MOBA mobile production. Traditionally, women prefer different types of games to a male audience – more casual but based on quick thinking and those offering engaging experiences. They also prefer games based on real-life games of chance. In 2014 the gaming platform Flurry had compared the time spent on popular genres by gender, and female users turned out to spend significantly more time than male on such games as brain puzzle/quiz, match puzzle/bubble shooters, casino/poker, slots, bingo, solitaire, and management/simulation. Needless to say, more and more gaming companies will produce games that are suited to a large and growing female audience. GameDesire, an acclaimed developer of mobile games from Poland, is currently in the process of launching its bingo game, Tiffany’s Bingo, to US audiences. Designed specifically for female gamers, with colorful and eye-pleasing graphics that compliment engaging yet causal gameplay, female characters taking the lead on-screen. With several worlds to explore, and an adorable pet companion - a dog named Bingo - for which players can unlock special items, Tiffany’s Bingo offers three bingo modes – 11, 75 and 90 – and an additional slots world. It’s available for free on Android and iOS.